Welcome to The Abso!ute Sound online! We explore music and the reproduction of music in the home. We believe that the sound of music, unamplified, occurring in a real space is a philosophic absolute against which we may judge the performance of devices designed to reproduce music. Our goal is to provide the resources consumers need to judge how a component's sound either honors or departs from the music's truth, and to make sound purchasing decisions that maximize their experience of reproduced sound. Below is our Issue 181, April / May 2008 contents and editorial. Read this edition's editorial by clicking here. Robert Harley visits "The World's Number One Audiophile." Our top equipment picks in every category and price level. 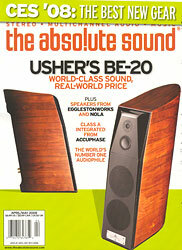 29 High End Audio Extravaganza! Chris Martens on a flagship speaker from Usher that re-defines the price/performance equation. Ten grand for 30 watts per channel? Yep, but they might be the sweetest watts you've heard, says Sue Kraft. Sallie Reynolds on two editions of a mid-priced tube linestage with a hint of magic. Tom Martin discovers something special in this latest design from Carl Marchisotto. Anthony H. Cordesman on a speaker that favors musicality over hi-fi fireworks. Harry Pearson on the 2008 CES. We talk with Jean Poulin of Simaudio.